All Tatum Dance classes are appropriate for both boys and girls. Age groups may be structured differently at your learning center depending on enrollment. All material in TD’s curriculum is age appropriate and modest in nature. *Mature 2.5 yr. old boys and girls can be admitted into dance and/or tumbling classes with the Director’s permission. Creative movement focuses on exploring the elements of time space, and energy (force) and creating shapes through everyday and dance specific locomotor and nonlocomotor movements to gain movement competency. The aim of this dance form is to preserve the child’s spontaneity of movement while enhancing movement vocabulary and repertoire. Often times, activities during the creative movement class are child-centered. The dance form is age appropriate for preschool through elementary children. Creative movement has gained further support from educational theories such as multiple intelligences, integration, and brain research. 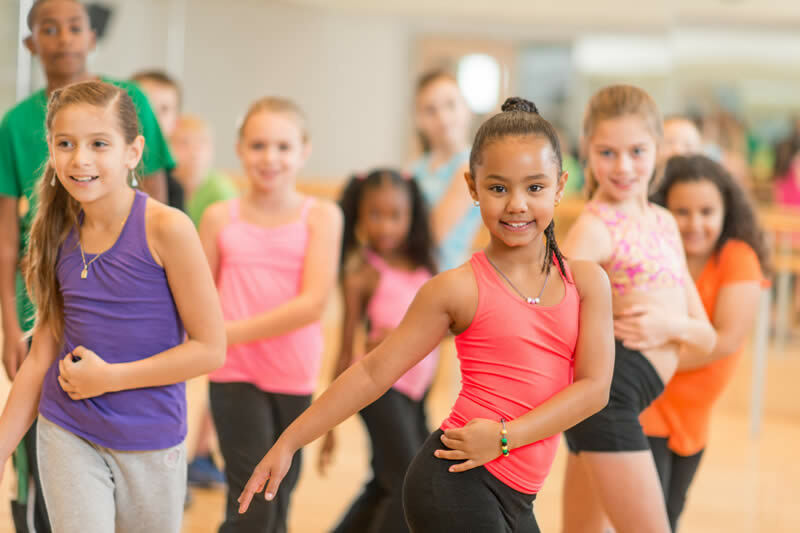 TD offers creative movement to introduce young learners to dance and become a natural conduit to the study of ballet, modern dance, tap, and other dance forms. While many parents are quite capable of teaching their little ones a few basic tumbling skills, most also agree that their kids can benefit from participating in organized tumbling classes/movement classes. Instruction for young children typically focuses on fun and socialization, rather than on form, but children who are enrolled in the 1.5-2.5 Yr. Movement/Tot Tumbling classes will begin to properly perform a number of very basic gymnastics exercises, release desires to play and tumble, begin gaining flexibility and explore movement move creatively. This class usually has two instructors to help keep the little ones ‘on-task.’ Tumbling mats, suede floor beam, octagon mat, props, creative movement elements/music, and a tunnel are used in this class. This unique class meets for 30 min. each week. * 1.5yr. old students will not participate in the winter recital or the Hawks game; however, they can perform in the spring production. Your little one will need a costume for this event. Specifics TBA. Pre-Ballet uses some of the same traditional dance elements found in our creative movement classes. However, the focus of pre-ballet class is to introduce the structure of a ballet class, basic ballet etiquette and terminology, basic positions of the feet, posture and basic port de bras (carriage of the arms). Emphasis is placed on providing a proper ballet foundation to prepare the young dancer for a formal class while still having fun. Pre-ballet classes are less formal than a regular ballet class and incorporate props and variation for young attention span. Our ballet classes build upon the foundation of pre-ballet classes and are more formal in structure. Use of the ballet barre is introduced as well as center and across the floor combinations. This class includes basic ballet history, memorization of combinations, development of body alignment, introduction of turn-out vs. parallel, turns and increasingly difficult ballet steps. At this age, the State and National Dance Standards for Dance Education are incorporated into each lesson. Click here for a list of these standards. Tumbling or pre-gymnastics offers boys and girls a chance to explore moving through the discipline of gymnastics. This class improves children’s flexibility, strength and body awareness. Fitness, rolling skills, bridging skills, and upright balance and locomotion are introduced with safety being the first priority. Small-scale gym equipment is used in each class including mats, a low balance beam, and an octagon-tumbler. Wedges and hula-hoops can also be used in class. The curriculum wheel shown below is a model of gymnastics instruction that establishes a general direction for instruction (clockwise around the wheel – starting at Fitness), while allowing some freedom in actual skill selection (within each movement family “pie-slice”). The curriculum wheel is an attempt to be simultaneously tight and loose, to acknowledge an overall direction of instruction while incorporating individual learning paths. The Figure shows a curriculum wheel for tumbling. Jay, M. Danielle, Gayle Kassing. Dance Teaching Methods and Curriculum Design. Champaign: Human Kinetics, 2003. Grant, G. Technical Manual and Dictionary of Classical Ballet Technique. New York: Dover, 1982. Jazz dance is constantly changing and evolving and is influenced by the music popular dances of the times. TD uses classic jazz technique from Matt Mattox to train students in basics and warm-ups as well as contemporary jazz styles from choreographers around Atlanta and pop-culture. Jazz has its roots in African American, Afro-Cuban, Haitian and Hindu (East Indian) cultures of dance as well as ballet and modern dance. TD educates the student in basic jazz history and uses an eclectic approach of incorporating jazz dance elements found in choreographers Bob Fosse, Luigi, and Joe Tremaine. Technique is age appropriate and modest in nature. Contemporary dance is not a specific style or technique. It is a compilation of ballet, modern and jazz. Contemporary dance is a reflection of the dancer and choreographer and requires training and application of ballet, modern and jazz dance by the dancer. Improvisational skills are required of the dancer. Contemporary dance is very emotional and often tells a story to music. In America, lyrical dance is often closely related to contemporary dance. Dancers will learn basic-intermediate floor work, turns, falls, complex combinations and how to emote using dance technique and choreography. Tatum Dance offers a great program for boys and girls who love to act, sing and dance. This class can be custom tailored to your learning center to fit your needs and the age of your students. Each musical theater class concludes with a children’s production for parents and schoolmates. TD selects productions that convey a positive message for youth told through humor, skits, dancing and pantomime.